Brewery Ommegang has long been one of my favorite breweries, and I do credit it with introducing me to the world of "good" beer. 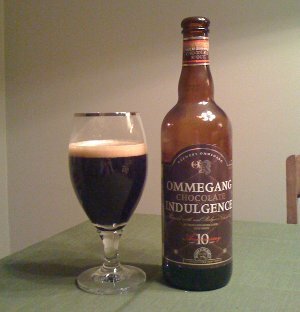 As such, whenever I see a new beer from Ommegang, I usually snap one up and drink it as quickly as possible. This particular beer, though, has never really been on my list of most sought after beers, mostly because it's a self-described Belgian Style Stout. I've never been a big fan of stouts, but since I've been coming around to the idea lately, I figured this would be worth a shot. After all, I love Belgian style beers, so maybe that will compensate for whatever it is I don't like about stouts. Unfortunately, this one turned out rather like my last experiment with Belgian style stouts (though I think both are technically labeled as Belgian Dark Ales). Beer Nerd Details: 7% ABV bottled (750 ml caged and corked bottle). Drank out of a goblet. I've long professed my love for Yuengling Lager. 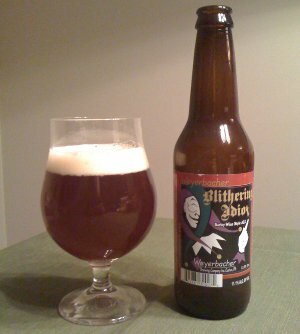 It's not a face-melting beer by any stretch of the imagination, but it's solid and dependable and locally ubiquitous. 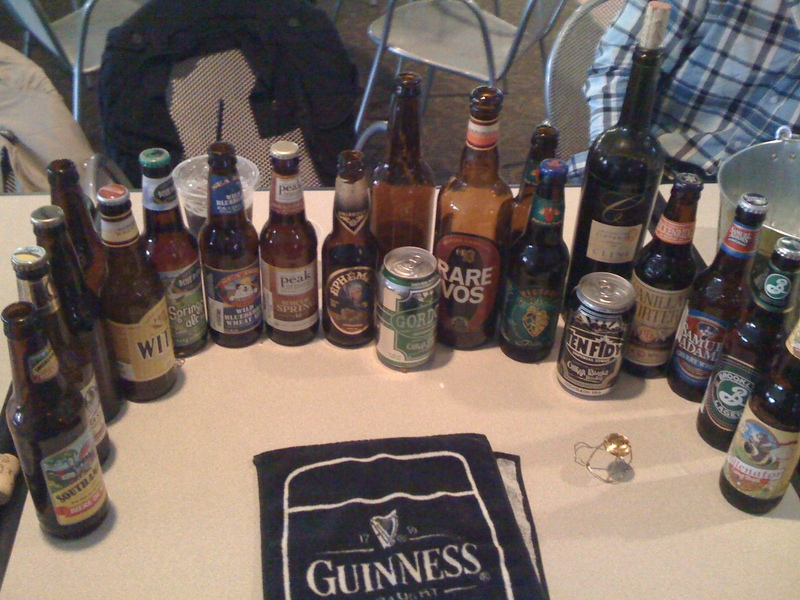 Over the year's I've tried most of their other beers - the porter, the black and tan, the premium lager, and various light varieties - but none of those really stick out. Then I see this new beer with a fancy vintage label design that I don't recognize. 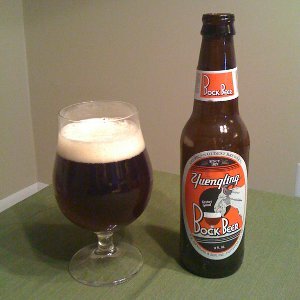 Yuengling makes a Bock? And it's a seasonal release? Wow, I had no idea. Apparently this seasonal beer was once a staple release, but it hasn't been brewed for nearly 40 years. To celebrate Yuengling's 180th anniversary, they did a limited, keg-only release that was so popular that they decided to make it a regular thing. Since I was in the market for some non-face-melting beer to drink during my Lenten coke fasting, immediately picked up a sixer of this. Beer Nerd Details: 5.1% ABV bottled (12 oz). Drank from a tulip glass. I suspect this is exactly what Yuengling was going for though, and I certainly wasn't expecting anything overly special, but it would be interesting to see what Yuengling could accomplish if they put their resources behind a more unique and powerful beer. I don't really expect that anytime soon though. Yuengling isn't a craft brewery, after all. But they're certainly better than other macros! This week's double feature was a whopper. Barleywines are among the strongest beer styles out there (both of the below beers are over 11% ABV), so I knew I was in for an interesting night. From a filmic perspective, I was going to try and match the intensity of the style, but decided to go another route and perhaps contrast the style with something a little more lighthearted. As luck would have it, Netflix sent me an intriguing double feature this week: For Your Height Only and Challenge of the Tiger (both on the same disc, no less). If you haven't heard of them, I don't blame you. They're both pretty horrible films, but I was hoping for a "so bad they're good" experience out of them. BrewDog and Mikkeller Collaboration: Devine Rebel - Scottish brewery BrewDog has been making a name for themselves with some very extreme beers. They were one of the crazy breweries attempting to make the strongest beer in the world, achieving and losing that status multiple times in an arms race that seems to have only recently ended. I believe they currently hold the record with a 55% ABV behemoth called The End of History (which you may recognize as the beer that's packaged inside a rodent carcass). Interestingly, they also make a 0.5% ABV beer called Nanny State (apparently a response to uptight government officials worried about the brewery's pursuit of the strongest beer title). Clearly, these guys are not to be messed with. Enter Mikkel Borg Bjergsø, a crazy Danish homebrewer and self-described "gipsy-brewer" who takes his show on the road, brewing his beers at different breweries throughout the world. He has a home base of sorts at the Mikkeller Bar in Copenhagen, but that is not a brewery. He releases his beers under the Mikkeller brand, and I suspect the fact that he doesn't actually own a brewery is partly why his beers tend to cost so much. Clearly Mikkeller and BrewDog are a match made in heaven, so when Mikkel heads over to Scottland to collaborate on this beer, titled Devine Rebel, you know the results will at least be interesting. For the life of me, I cannot figure out why Devine is spelled with an "e" there (instead of the more traditional "Divine"). Maybe it's one of them alternate British spellings of the same word, or who knows, maybe Mikkel is an amateur astronomer and named his beer after an asteroid. Whatever the case, it's quite an eclectic brew. Partially aged in Speyside whisky barrels* and utilizing both an ale yeast and a champagne yeast, I was expecting a lot out of this beer, and boy did it live up to expectations. Beer Nerd Details: 12.1% ABV bottled (12 oz). Drank out of a goblet. Batch 243, bottled on 7/5/09 (so not quite two years in the bottle, but close). Beer Nerd Details: 11.1% ABV bottled (12 oz). Drank out of a tulip glass. I've got a few more Blithering Idiots in the fridge right now, and given the fact that this style ages well (part of the reason it's called a Barleywine is that it can be aged, like wine) I think I'll let them stay there for a while. 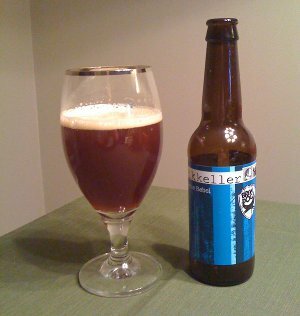 In the meantime, I'm going to try and find me some more Mikkeller beers (and BrewDog beers, for that matter). It looks like the 2010 version of Devine Rebel came out a bit stronger (13.8% ABV! ), so I'll have to try and find me some of that as well. * I expect a certain Scotch loving reader will be salivating at this particular detail. I like Scotch, though I should also note that I'm certainly no expert. I pour myself a dram every now and again, and drink it slowly, attempting to pick out flavors. But then I read Water of Life and, to be honest, I don't really perceive the distinctions of flavors the way they seem to... On the other hand, that's how I felt about BeerAdvocate reviews up until about a year ago, when I started getting serious about this whole beer thing, so perhaps there's hope for me yet. In any case, those wily Scotts do more than make great whisky*. There's a whole continuum of Scottish ales, ranging from light to heavy strength and historically designated in shillings (which at some point corresponded to a price of a barrel, but the specifics seem unclear). The strengths roughly correspond to the strengths of English bitter, though at the higher end, things get a little more confusing. At higher alcohol levels (approx. 6% and higher), the beer is simply called a Scotch Ale or a "Wee Heavy". The origin of the phrase "Wee Heavy" is a bit difficult to pin down, but as near as I can tell it refers to the historical serving size of 6 fluid ounces (about 1/3 of an imperial pint). A "wee" glass of "heavy" ale, as it were. Because Scotland is further north and because of their... complicated... relationship with England**, these beers have some interesting historical characteristics. The cooler climate was not that conducive to growing hops, which meant that they needed to import them from England. As such, Scottish ales were generally lightly hopped. Tee hee. The lower temperatures also impact fermentation, meaning that these beers display less in the way of fruity or spicy flavors. Add all this together, and what you've got is a beer that emphasizes the malt (while yeast and hops generally take a back seat), sometimes even featuring peat and smoke, which seems appropriate for the land of Scotch whisky. I will make arrangements to try more of this style, though none are in the pipeline at the moment. I think, perhaps, some double features are in order here though, perhaps even mixing with some Scotch whisky to see if I can start to pick out some of the more subtle similarities. * Also worth noting: Scottish Breakfast Tea, which apparently has a complementary flavor profile. Perhaps I can do a full day's worth of Scottish beverages: Scottish Breakfast Tea in the morning, some Scotch Ale with lunch and dinner, and a Scotch Whisky nightcap. Sounds like a good day to me. ** I should probably make some sort of William Wallace joke here. Or maybe a Mel Gibson joke. But that would be too easy***. **** Also, I've apparently been listening to Scottish hip hop for the past half hour or so. Go figure. Also of note: blatant abuse of asterisks. 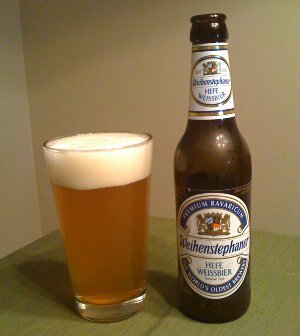 As the weather warms and I begin to consider my next homebrew, I thought I should look into brewing something appropriate for summer, and of course the first thing that came to mind was wheat beers. Given my Belgian tendencies, you'd think I would gravitate towards a Belgian Witbier, but I also wanted to check out some Hefeweizens, as I've noticed that German beers are somewhat underrepresented on this blog. 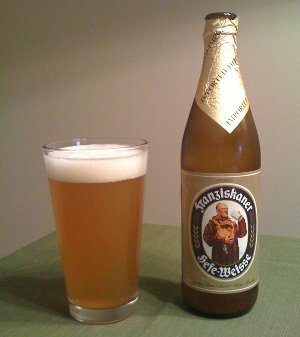 Breaking down the style's name, "Hefe" is translated as "with yeast", meaning that the beer is unfiltered and will contain yeast (in fact, the spicy and unique yeast is key to the style), and "weizen" means "wheat". The difference between the Hefeweizen and the Belgian Witbier is that those wacky Belgians are always adding spices (like coriander and orange peel, amongst other, stranger, spices) whilst the Germans are very rigid in their brewing process. The original German Beer Purity Law (aka Reinheitsgebot or Bavarian Purity Law) limited the ingredients in beer to water, barley, and hops. This was later expanded to include wheat and, once it was discovered, yeast. The law was repealed over 20 years ago, but most German brewers are proud of their traditions and claim to still abide by it, even using it for marketing purposes. So no spices for the Germans. I always find this sort of thing interesting though. Sometimes working within the box can be more rewarding or impressive than thinking outside the box. Using only the 4 annointed ingredients, the Germans are able to brew some really fantastic beer with a wide range of flavors and aromas. In a historical sense, this sort of purity law no doubt forced a lot of innovation within its boundaries while still retaining quality and consistency (two things that were much more difficult in the 16th century than they are today), and that's admirable. There's also something comforting and awe-inspiring about drinking a beer that is brewed in essentially the same way it was hundreds of years ago. Of course, this isn't to say that thinking outside the box is a bad thing either, and indeed, I think that German brewers' lack of experimentation may be hurting them now that craft brewing has exploded in America. Indeed, even mainstream publications are catching on that German beer culture is in decline. As Charles Houston Decker notes: "...it's hard to look at a thriving American beer culture, a dying German one, and not pay attention to the obvious major difference between the two." It seems obvious to me that German beer culture won't vanish, and in some ways I kinda like that they're sticking to their guns and producing high quality beer according to their proud traditions. I think there's a lot of value in the basic fundamentals of beer brewing, and I'm glad someone has a different take on it than crazy Americans and Belgians. I'm always intrigued by these sorts of tensions: Oil and water, Democrat and Republican, John and Paul, American beer innovation and German tradition, and so on. It's important to have a variety of approaches to something like brewing, and while I probably prefer my crazy American beers to traditional German varieties, I'm glad both still exist. Beer Nerd Details: 5.4% ABV bottled (12 oz). Drank out of a shaker pint glass. Drank on 3/18/11. Beer Nerd Details: 5% ABV bottled (500 ml). Drank out of a shaker pint glass. Drank on 3/18/11. I have to admit that I enjoyed both of these better than my recent Belgian Witbiers, so it looks like my next homebrew will most likely be a Hefeweizen. It looks like Norther Brewer has a nice Bavarian Hefeweizen extract kit, though the OG is perhaps a bit lower than what I was looking for (that should be easily remedied though). Interestingly, it looks like the brewing process is a lot simpler than my previous beers: no specialty grains, only one hops addition, and ready to drink within 4 weeks. We all know the famous stories about how India Pale Ale was brewed extra strong and with extra hops so that it could survive the long and warm trek to India. 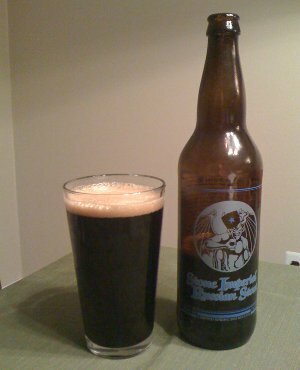 Slightly less known (though probably common knowledge amongst beer nerds) is the Russian Imperial Stout. Apparently the court of Catherine the Great was quite fond of English stouts, but once again, the logistics of shipping the beer required certain adjustments to the usual recipes. Like the trip to India, the trip to Russia was a long one. And it was cold enough that weak beers would freeze en route. So English brewers took to making an extra strong stout, usually around 10% ABV, to prevent their cargo from freezing (among other preservative reasons to protect against the duration of the trip). 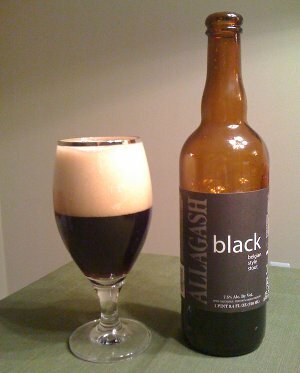 More imperial stouts are on the shelf and in the fridge, and I'm actually looking forward to a few of them quite a bit. I don't think that stouts will ever be my favorite style, but I'm definitely gaining a big appreciation for them. I have to admit that I have really grown to love the concept of a double feature. So far, I've generally used the opportunity to compare two beers of similar style to see how different they can be (not to mention, which is better). I feel like I'm getting better at evaluating beer, but I still really appreciate the opportunity to compare two beers of similar style, one after the other. It's something you don't see much. For instance, you rarely, if ever, see any sort of comparative notes on Beer Advocate or Rate Beer. I always found this strange. It would be much more helpful if you could tell me how a given beer differs from a standard or, at least, common version of a beer. Noted beer scribe Andy Crouch has recently lamented the state of beer writing, citing the common reliance on tasting notes as a crutch that are uninteresting. I can see how one person's subjective evaluation of beer at a micro level could get tiresome, and indeed, much of the beer blogosphere is focused on that sort of thing. 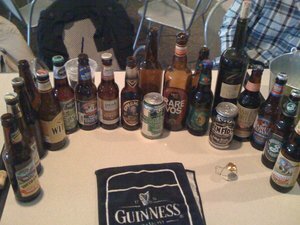 In the Aleheads' most recent All Beers Considered podcast, they discussed how boring a tasting notes sorta post could be, noting that they try to avoid such things. And yeah, I can see how that could strike some folks as being boring, especially if the review is solely based on one person's opinions. When I started this blog, I didn't really want to fall back on reviews or tasting notes, but I almost immediately settled into exactly that sort of post. I think this is perhaps due to my tendency to blog for my own benefit, as opposed to what other people will want to read. This is no doubt why I have, like, 2 regular readers (if that). But as usual, my pattern of long-winded online writing has taken hold. Lately, I've been trying to be more interesting with what I write, even if it almost always culminates with tasting notes. Writing a review is easy, but being interesting and providing more information about the beer, the history of the style, or whatever, is more difficult, and I seem to have started to provide more context about the beers I'm writing about. I always tried to spice things up with my other passion, movies. But I'm sure most beer blog readers don't really care much about that, unless I get ambitious and come up with a screenplay post. Still, I hope that my recent writing has been more enjoyable. I also hope that these double feature posts, with comparative reviews of similar styles, are considered more helpful and interesting than a simple tasting note. And tonight, I have a particularly interesting double feature. I didn't watch two movies (as I often do), but I was switching back and forth between the Flyers game (we clinched a playoff spot tonight) and the NCAA Wrestling championships (college wrestling is rarely televised, so this was a welcome surprise). 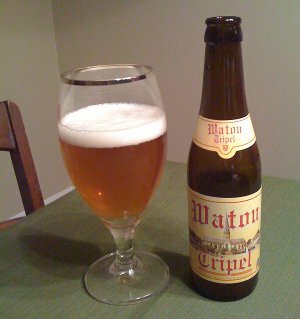 On the beer front, I tried two tripels I've been meaning to drink for a few months now. I always find it interesting when a single brewery releases multiple beers of the same style. When it comes to a style with a wide variation in flavors, like an IPA, it certainly makes sense. 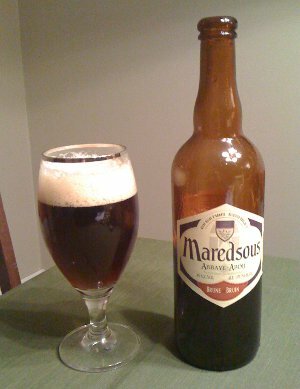 But for more narrow styles, like, for example, a Belgian style dubbel or tripel, there seems to be less room for variation. 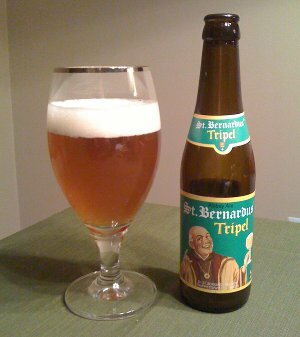 That being said, when I got my hands on a variety pack featuring 6 different St. Bernardus beers, I noticed that there were two dubbels and two tripels. The dubbels turned out to be interesting - one was a lot lighter than I was accustomed to, and the other was more of a standard dubbel. Both were great. And tonight, I've got two tripels for you. Palate cleansed with a single UTZ pretzel rod. Beer Nerd Details: 7.5% ABV bottled (330 ml). Drank from a goblet. There's less variation between the two than there were between the the St. Bernardus 6 and 8 versions of the dubbel, but I think the Watau is the clear winner. The differences are subtle enough that I can see why folks who don't drink them back to back don't offer much comparison between the two, but drinking them back to back made it clear to me.